This is Part 2 in a series of photo galleries showing pictures of Oriental dance performances I saw while I was in Turkey in July, 2000. This gallery features the four dancers who appeared in the show at Gar Gazinosu, a nightclub in Istanbul that caters to the tourist audiences. See the Related Articles section at the end of this article for links to the other photo galleries of dance highlights from my trip to Turkey. Back in the late 1980's and early 1990's, the primary theme in Turkish costuming seemed to be skimpiness. As seen in videos of Turkish dance from that era, "skirts" were scarcely more than sequinned loincloths. Based on what I saw in my July 2000 visit to Turkey, I'm pleased to say that dancers appear to have moved away from skimpiness, and now the look tends to be one of elegance. Or at least, that's the case at the better places. Unfortunately, I didn't get the names of the dancers who performed that night at Gar Gazinosu, so I can only identify them as "First Dancer", etc. Throughout this article, it is possible to view the photos in more detail by clicking on them. All photos by Shira. Copyright 2000. In other words, please don't steal them and put them on your own web site! This was the first dancer to appear in the show at Gar Gazinosu in Istanbul on July 12, 2000. Her colorful skirt formed many interesting effects as it moved. After finishing her performance, this dancer and a photographer went around to each guest in the restaurant and she posed for a picture with them. Afterward, the pictures were posted out front so patrons could decide whether to purchase copies or not. Out of the four dancers who were featured in this show, this was the only one to pose for pictures. Many Turkish dancers, including this one, incorporate kneeling backbends into their performances. To the left is a photo showing the back of this costume. These pictures show the second Oriental dance act to appear in the show at Gar Gazinosu in Istanbul on July 12, 2000. These perky dancers performed an Egyptian-style cane choreography in a lively duet. Their costumes came across as elegant, but with the cutouts they were also just a bit daring. These pictures show how this costume looks from several angles. Note that the skirt is asymmetric. As seen on the brunette, the right side has a slit about halfway up the thigh, with a cutout above that. On the left side, as seen on the blonde, the cutout lies high on the side of the hip. Sequinned bands across the opening create a spider web effect. Their use of canes as a prop shows the influence that Egyptian dance has had on Turkey. In Egypt, dancing with a cane has its roots in a folkloric tradition. 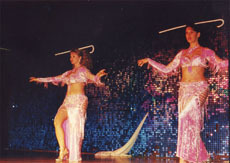 Today, Turkish dancers appear to be heavily influenced by Egypt in their choice of music and props. At one point in the show, these dancers balanced their canes on their breasts. Oh my! My camera wasn't fast enough to capture that act of dexterity, but I did get this shot of them balancing the canes on their heads. Later in the show, these dancers recruited a couple of men from the audience to get on stage and dance with them. Based on the shows we saw and the costume shopping we did at two different vendors, it seems like the primary theme in the higher-class Turkish-style costumes today is cutouts, particularly in the skirt and belt. Note these photos of the duet dancers at Gar Gazinosu in Istanbul. There are cutouts in both their gauntlets and their skirts. What an entrance! The third dancer to perform at Gar Gazinosu was clearly the headliner for the evening. As shown in the photo here, she was lowered from the ceiling on a glittery platform. Now, if only I could talk the clubs where I perform into rigging a similar setup for me! This dancer emulated the Egyptian-style entrance of carrying a veil around the stage, then dropping it after a few flourishes. Although I saw many dancers in Turkey copying this idea, this dancer did so more artistically than most. As shown in the photo to the right, she held the veil in a variety of attractive poses before discarding it. Many dancers in Turkey use the approach of having the skirt sewn directly to the belt when the belt has cutouts in its design. By attaching the skirt directly to the belt, the dancer ensures that the skirt won't creep into a position that hides what the cutouts are meant to reveal. The photo to the left shows how this dancer employed cutouts on one side of her belt. Rather than simply exposing bare skin directly underneath, the belt exposed sheer red chiffon. This view in the photo to the right of her other side shows an area where the belt and the chiffon were cut away to reveal a diamond-shaped patch of skin.